Nothing makes a girl sparkle like a gem on her finger! Yeah, okay, I don't totally mean that, but I do love a pretty and simple ring, which is why I'm sharing my latest purchase from Dreamy Rings on Etsy. I got this lovely sapphire heart stone set in silver ring made in my size and I love it! I have to admit that I'm really partial to heart-rings. My most cherished ring is a heart-cut of my birth stone set in gold, which I've had since I was 14 years old! Dreamy Rings has such a selection, it made my choice difficult! I would love to have tons, but realistically I'll only wear one at a time, so dangerous. But I've already ordered a second ring from here and can't wait for it to arrive. Prices range from $30 to $770 USD, so there should be something for any budget. I really appreciate the sizing option as no one ever stocks my size, so anytime I've ever bought a ring I've always had to get it resized. 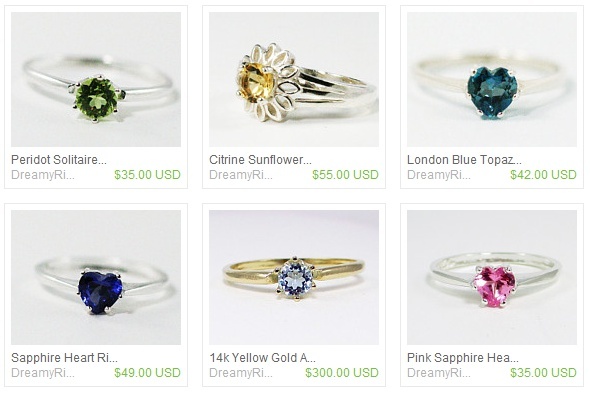 Here is a small selection of some of the gorgeous offerings at Dreamy Rings. Aren't they lovely? That's gorgeous. Very dainty and aren't sapphires beautiful. My late mother's engagement ring was a sapphire with a diamond on either side. You don't see settings like that any more. Everyone seems to want diamonds, overlooking how attractive semi precious stones are in a ring. Your mother's ring sounds beautiful. Yeah, I have nothing against diamonds, but honestly it's more about what the ring symbolizes and those semi precious stones are just as beautiful to me too.